Abilene Star Prairie Curtain Set - 63" x 36"
Abilene Star Swag Set - 36" x 36"
Kendra Stripe Lined Prairie Curtain Set - 63" x 36"
Dimensions 63.0 In. X 36.0 In. X 1.0 In. Photos truly do not do these curtains justice. They are heavier than they appear, but still light enough to let light shine through. The stars are not printed on, but rather sewn on with just enough fray on the edges of the stars to keep the primitive feel. The curtain edges themselves are sewn perfectly with a lovely scalloped edge. I paired them with the matching Abilene Star Valance for the perfect country look to complete my living room and dining room. I would absolutely recommend these to anyone who is looking for that country, primitive, farmhouse "feel". These are perfect. I love the country look of these curtains. They are very well made. I would recommend them to a friend. 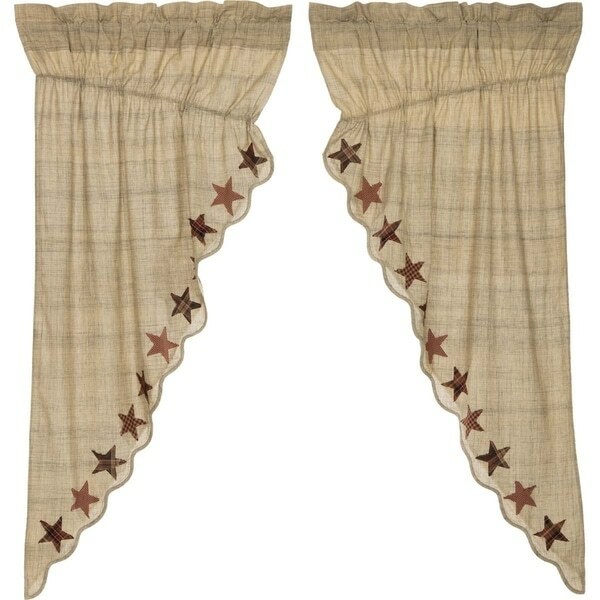 Stratton Burlap Applique Star Prairie Curtain Set - 63" x 36"
Kindred Star Lined Plaid Prairie Curtain Set of 2 - 63" x 36"